Staying at Moose Hollow Lodge in Pigeon Forge is the best decision you can make for your group vacation. Moose Hollow Lodge can sleep up to 56 people! It has 9 large bedrooms and plenty of space for all of your guests! 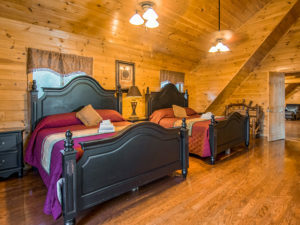 Whether you’re planning a family reunion, wedding celebration, church retreat, corporate retreat or other group vacation, Moose Hollow Lodge is the best large cabin in Pigeon Forge. 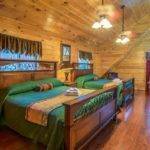 Do you want to see inside this large cabin in Pigeon Forge? Click here to tour Moose Hollow Lodge! When you’re looking to explore the area, Moose Hollow Lodge is in a perfect location! It’s close to all of the fun things to do in Pigeon Forge, Gatlinburg and Sevierville TN. This is especially great for when you’re spending time with a large group because there’s something for everyone. And if you’re looking to spend time together with your entire group, many of the attractions in Pigeon Forge can accommodate large groups – especially when you contact them ahead of time! 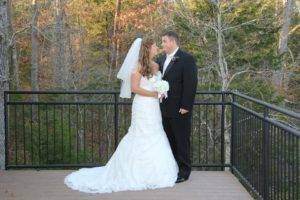 If you’re planning a wedding in Pigeon Forge, have you thought about an in-cabin wedding ceremony? 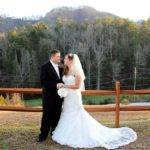 When you can have all of your friends and family stay with you, you’ll love the ease and convenience of having an in-cabin wedding in Pigeon Forge. All you’ll have to do is set up your ceremony area, decorate however you choose and hire a minister. Everyone will already be staying at the cabin with you, so you’ll have all the help you need. Plus, you won’t have to worry about everyone making it to the ceremony on time. And, even better, there’s a full kitchen, so you can set up your wedding reception, completely stress free! 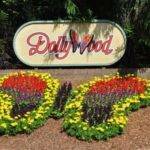 Are you ready to start planning your vacation to Pigeon Forge? 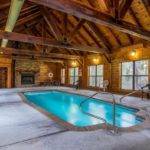 CLICK HERE to reserve Moose Hollow Lodge today! My family just had a vacation here from May 10th – 13th and it was amazing. We could not have had a better vacation! The view was amazing, the arcade games were amazing, the pool was amazing, it was all amazing. We made so many memories that we’ll never forget. Can’t wait to come back! If you have the chance to stay here, you won’t regret it!